It was a Saturday in March 1898 that a young David O. McKay found himself on a mission in southern Scotland in the town of Stirling. Having just found an apartment in the area, together with his companion, Peter Johnston, the two decided to spend their “diversion day” touring the main attraction of the town, the beautiful Stirling Castle. 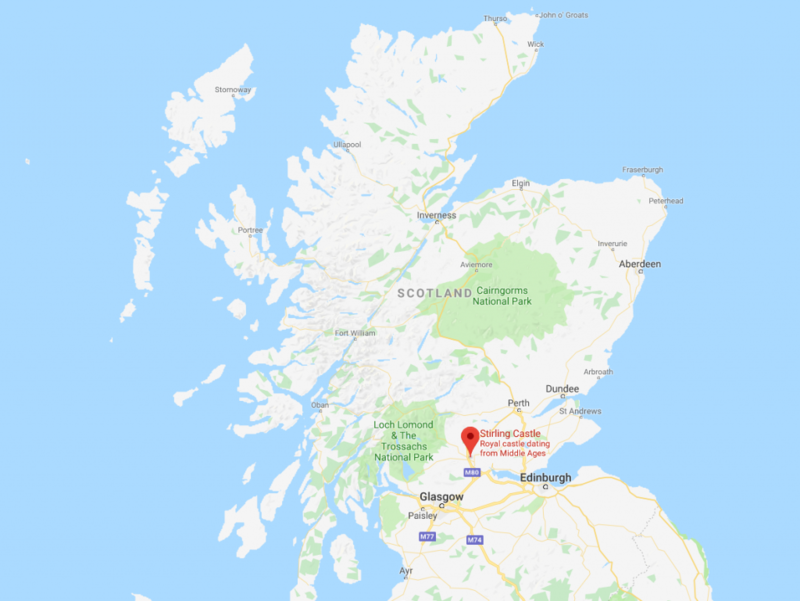 This is one of the most important castles in Scotland because of its role in defending the nation, as well as being the most popular home of Scotland’s kings and queens, including Mary, Queen of Scots, and Robert the Bruce. Around 5 o’clock that evening, as they walked back to town after visiting the castle, Elder McKay noticed a strange sign that was recently chiseled over the entrance to a new apartment building. At this time on his mission, Elder McKay was rather dispirited. Like most new missionaries, he discovered that missionary work id difficult, the hours are long, and discouragements are frequent. But after seeing this motto and pondering its meaning, he transformed his attitude and pivoted down a different course. David O. McKay, in Francis M. Gibbons, David O. McKay: Apostle to the World, Prophet of God (1986), 45. Elder McKay decided he would focus on doing the best he could regardless of his present circumstances. It didn’t matter whether he was a missionary or a mission president, or a teacher or an apostle, he would fulfill his duty, magnify his calling, and give it his very best effort. He eventually became the 9th President of the Church. According to the Church History Museum, the building that contained the stone was torn down and the stone was lost. Years later missionaries recognized the inscribed stone, which had been incorporated into a stone fence in the area. Knowing of its meaning and importance to President McKay, the Scottish Mission presidency acquired it and placed it on the mission home grounds, where it remained until 1970. After President McKay’s death, the stone was sent to Salt Lake City and included among his artifacts. It has been displayed in various locations but has been in the Church History Museum since 1984. 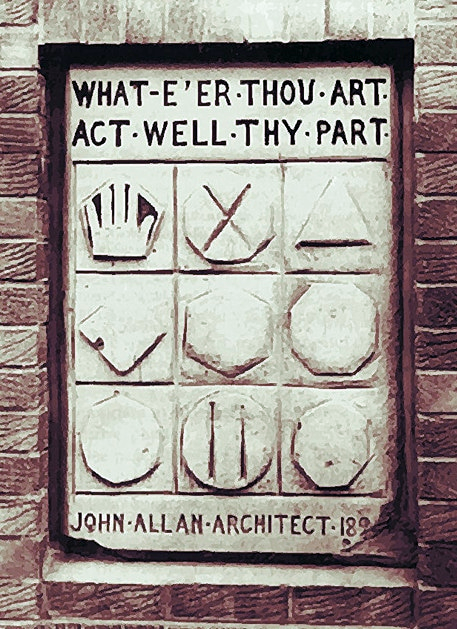 A replica of the stone is on display on the grounds of the Scotland/Ireland Mission Home. In addition to the motto, I have found that the symbols are also quite significant. You see, this is a numeric magic square, where the symbols represent numbers and when the number in a vertical column or in a horizontal row or even diagonally are added up, they all sum to the same number. In this case, it is 18. Why is this significant? Because if just one symbol is misunderstood, misplaced, or is missing, the entire square loses its meaning. Let’s say you didn’t interpret the pentagon shape as the number five (because it has five sides), but used a different number, or no number at all, the puzzle doesn’t make sense. It has lost all of its “magic” and just becomes an abstract piece of art. So it is with us in our families, quorums, classes, and organizations. If one of us is left out, or if we try to change positions with someone else, or if one of us doesn’t do our part, then the entire grouping doesn’t make sense. The overall outcome is dependent on each number acting well its part. The success of the group is dependent on the success of the individual, and vice versa. It is a symbiotic relationship. The Stirling stone should remind us that true happiness and fulfillment in life comes not from being recognized, but from being useful to the world around us. It comes from pulling our own weight – even in the small and obscure roles of life. And if we do our job, and everyone else does it too, then it will all work out. 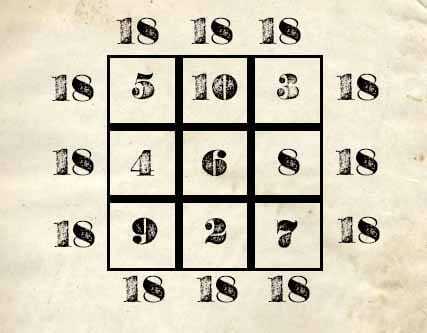 I find it interesting that the sum of the magic squares is 18. In Hebrew, the number 18 means “life”. In Chinese it means to be “rich”. In most countries it is the age of majority where we leave childhood behind and become adults. Even in numerology, it is associated with new beginnings and motivation and progress. With these meanings in mind, and thinking about how often we fall short in our callings and assignments and roles, it is helpful to associate the sum of this magic square with Jesus. He is the master of our souls, and has the ability to transform each of us into the piece that the puzzle requires, even if that means chipping off edges and making us more well-rounded. When we fail, he will help us out, restore us, and help us get back in the game. He is the one that makes everlasting life possible where we can progress eternally until we inherit all that the Father hath.